Porcelain painted with overglaze enamels (Jingdezhen ware). 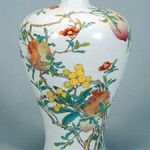 In this piece colors such as the white-pink and pale green of the peaches and the bright yellow of the loquats were only possible because of the expanded palette made available by the development of opaque enamels during the early eighteenth century at the imperial kilns and factories at Jingdezhen. 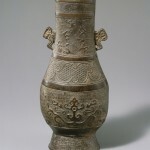 The range of colors used to paint this bottle, which dates to the reign of the Yongzheng emperor, are known in Chinese as “powdery colors” (fencai). The earliest lacquered vessel discovered so far dates to around 7000 BC. 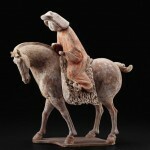 Excavated objects from the Shang dynasty (about 1500-1050 BC) and the Zhou dynasty (1050-221 BC) demonstrate the increasingly sophisticated methods of production and decoration used on lacquer. By the time of the Han dynasty (206 BC-AD 220), the production of lacquer vessels was a centrally managed industry, with specialised labour and mass production in government-owned workshops. 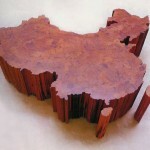 The manufacture of lacquer pieces required several distinct, very labour-intensive, steps. First, a core was made, usually by hollowing out a piece of wood, occasionally made from fabric (as with this toilet box). It was then coated with many, very thin layers of lacquer, each taking several days to dry before the next could be applied. After the final layer was dry, the item passed to workmen who specialized in decorative painting or incising of patterns, the application of gilding or metal handles, and a final polishing. 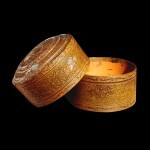 This box is painted with cloud scrolls and inlaid with silver. 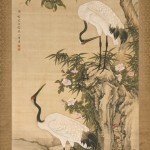 Fantastic heavenly creatures are visible among the lines of the painted scrolls. A box similar to this one can be seen in use by court ladies in the famous scroll attributed to Gu Kaizhi, The Admonitions of the Instructress to the Court Ladies in The British Museum, the original of which dates to about AD 353. 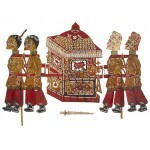 These shadow puppets are made of donkey hide and are in the form of a sedan chair with bearers. Wealthy Chinese people would have used these chairs to travel around in. Shadow plays are a theatrical tradition in many Asian countries where puppets are manipulated behind an illuminated screen. Most of the plays presented were adapted from popular stories, plays or folktales. 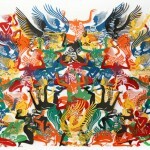 Musicians accompanied the performance with stringed and wind instruments, gongs, drums and cymbals. The puppets movements, singing and dialogue were all exaggerated.